So now that you’ve had twins, are you done? Or will your family still grow? Getting pregnant after twins will bring some new challenges but things will generally be easier than with twins. Let’s look at what to expect when you’re having a singleton after twins. Why more kids after twins? Perhaps you feel that your family just isn’t complete yet. That’s something only you know and can decide in discussions with your partner. You might also have some mental burden of your twins’ birth (and even a NICU stay) not being the ideal birth experience you were hoping for. 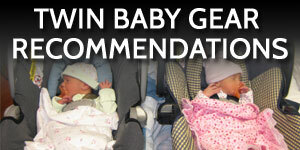 You view a new pregnancy and birth as your chance to have the birth you always wanted. It will likely take time for the burden of twins to ease so that you even think about wanting another child. You’ll be so swamped in twin child care and daily logistics that having another child is the farthest thing from your mind. What kind of age gap after twins is ideal? Opinions here vary. One camp says keep them all in diapers. Another group says wait for the twins to be potty trained. Again, here you know your capacity and strengths. Plan with those in mind. Having a third child after twins (or numbers 4, 5, etc.) brings a host of worries and concerns. These are natural to feel for both mom and dad. You might be truly scared about having twins again. Can lightning strike twice? Twins were so hard the first time, can you even consider that happening again? Remember that identical twins are random while fraternal twins tend to run in families. Another concern is how will your twins react to a new sibling? Will they welcome a new baby with open arms or rise up in rebellion? The truth is that you will likely experience both extremes at different times. Consider day care costs of your growing family. How are your finances now with your twins? Do you need to wait a bit for the math to work out and so you can pay for daycare? A single pregnancy after twins will be easier than your twin pregnancy. Twin pregnancies are notorious for complications, bed rest, and challenges for mom and babies. In comparison, your singleton pregnancy will feel like a walk in the park. Once your new baby arrives, things will seem so much easier with just one baby. This is especially true if the twins are at school. Your one-to-one ratio of parent to child will make caregiving a lot easier. Breastfeeding one baby will be easier than breastfeeding twins. You don’t have to coordinate two feedings and can focus on your one child. Getting one on one time is easier with a singleton baby. This will help you bond more quickly with your baby whereas before your attention was divided with the twins. After you’ve had twins, you’ve got the child care basics down. You know the drill: feeding, diapers, sleeping, cleaning, etc. You know how babies work and can use your experience to your advantage. Having kids close together often leads to them being good friends and having someone to play with right away. Our four children are all within three years of each other and we’ve seen these friendships and play situations work well. Some twin parents I’ve talked with say that sibling rivalry isn’t as bad after twins since each twin is are already used to not being the only show in town when a baby arrives. While there are lots of positive things about having another child after twins, it isn’t all sunshine and roses. The reality of handling logistics of three (or more) children can be overwhelming. Particularly if you are alone. With twins, you will have worked out a system for getting out of the house. Add another child to the mix, and nothing will seem to work. Toddlers and a baby? Where do they all fit? Two in a stroller and baby wearing the other? Going shopping or running errands approaches Olympic feats. Once your new baby is born, there will be a honeymoon phase where you have family or friends around the house and your twins feel the love and attention too. Once people return home, your twins will start to demonstrate jealousy through acts of rebellion, breaking schedules, sleep regression, eating changes, etc. Those can be overwhelming, especially if you’re already up all night feeding a newborn. 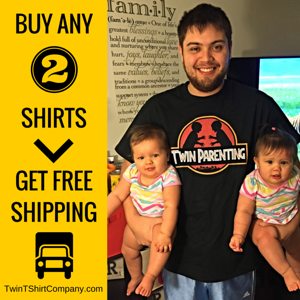 When our twins were born, they joined two brothers and instantly we had four children ages three and under. Our house was crazy town and still is most days. Keeping things tidy, clean, and organized has been nearly impossible. If you have your children close together in age, they will tend to go through phases together. You’ll have intense seasons of potty training, learning to talk, nap and sleep schedule craziness, and more. Having twins is a huge challenge. The effort and exhaustion you’ve experienced will likely never be seen again. Having twins made you stronger. You’re a better parent and your capacity to love and care for your children has grown as you’ve gone through the crucible of the first several months with twins. You’re stronger and more able to cope with a new baby than you were before twins. If having another child after twins is right for your family, you’ll do great. Take what you’ve learned from raising twins and you’ll be a parenting superstar. Your friends and family will look on in awe as you expertly handle 3 or more children all by yourself. You’re awesome! Don't forget to pick up a copy of the definitive guide to raising twins. 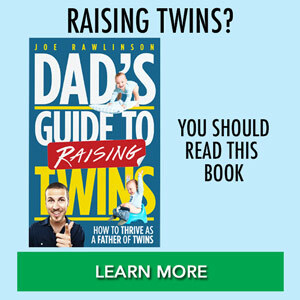 "Dad's Guide to Raising Twins" was written for fathers of twins to help guide you through the first several years with twins. Click here to learn more about the book and get your copy. 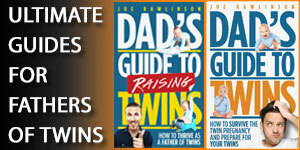 Sign up now and get your FREE copy of "7 Tips for Surviving Newborn Twins"
Send Me The Twin Parenting Tips! Joe Rawlinson is the father of four children. Two boys and identical twin girls. Twins are a blast. I love mine to pieces. I just wish I knew what I know now before this whole adventure began. Expecting twins? This book will help you know what to expect and specifically how to prepare for their arrival. Learn more about the book. Raising twins? 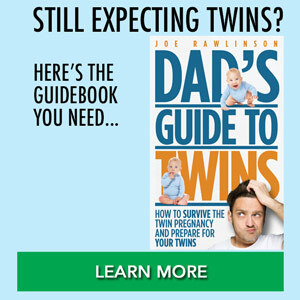 This book will help you through the early years with twins. Learn more about the book. 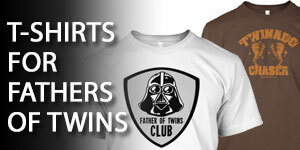 Dad’s Guide to Twins is a brand and PR friendly site. Invite Joe to speak at your event. © Copyright 2008-2019 Joe Rawlinson and Texadero LLC. All Rights Reserved. Please note that I am not a doctor, lawyer, or accountant so take my advice with a grain of salt and always consult a qualified professional. Everything on this page is provided as general information and doesn’t imply specific medical advice, diagnosis or treatment. Always consult with your medical professional. Links to 3rd party products and services may be affiliate links where I receive a commission if you buy (at no cost to you). You know, to feed the twins.